Start your day with a delicious Ham and Vegetable Omelet. This omelet recipe takes just a few minutes to make and it’s packed with good protein and fresh veggies. This is by far my favorite way to eat eggs and under 200 calories you can’t do much better than this! This coming summer my family and I are going back to Europe on a backpacking trip for a few weeks. This exciting adventure is making me want to get back into more healthy eating habits since we are going to be walking from place to place quite a bit. For me clean lean protein, tons of fresh veggies, and much needed water ( I HATE WATER!) seem to make the trick. 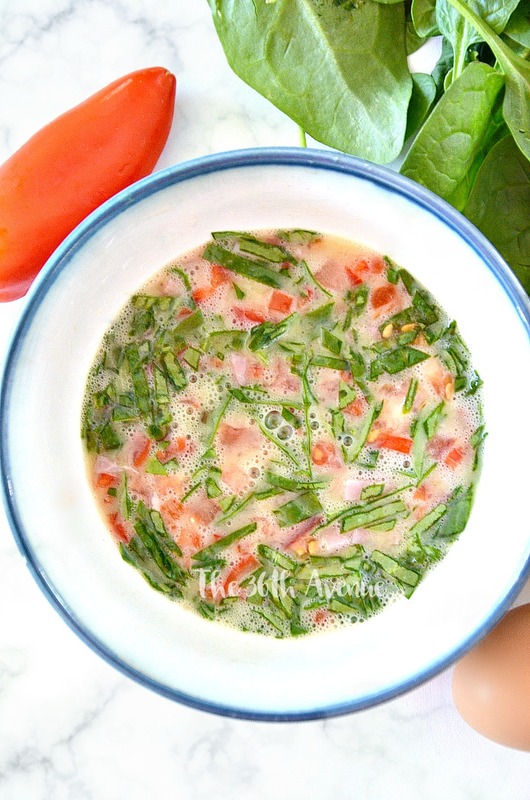 This Ham and Vegetable Omelet Recipe is delicious and and you don’t have to sacrifice great taste in order to eat healthy. My teens also LOVE this colorful combo of goodness, so it’s a great choice for weekend breakfast! For this recipe you are going to need veggies that you may already use for your salads. 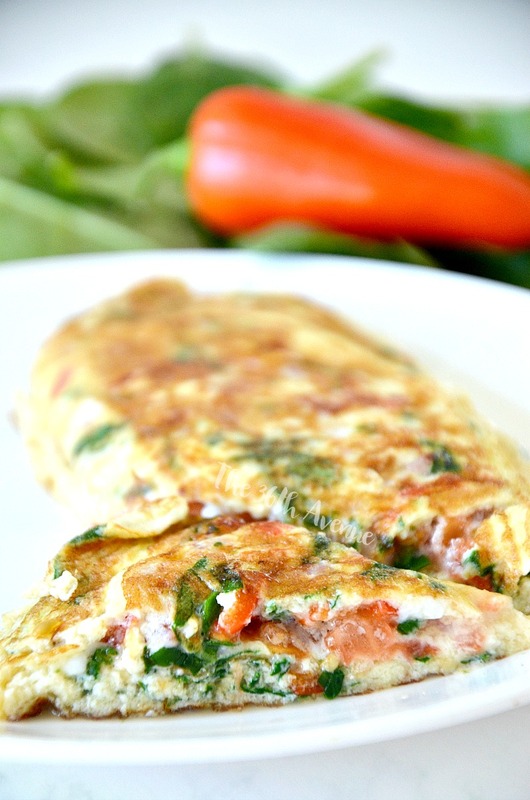 The baby spinach, mini red bell peppers, and tomatoes make these omelets super moist inside. The ham adds texture and a punch of flavor. First chop your veggies and then mix them with your egg and egg whites. Look already how yummy this looks! Then cook this mixture on a non stick skillet or an omelet pan…Turning once to make the omelet. Now you are ready to eat! 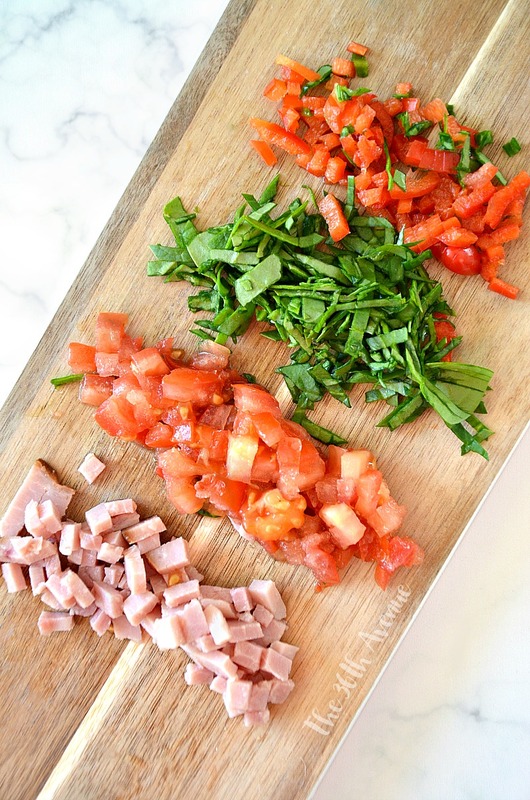 Here is the full Ham & Veggie Omelet Recipe for YOU! 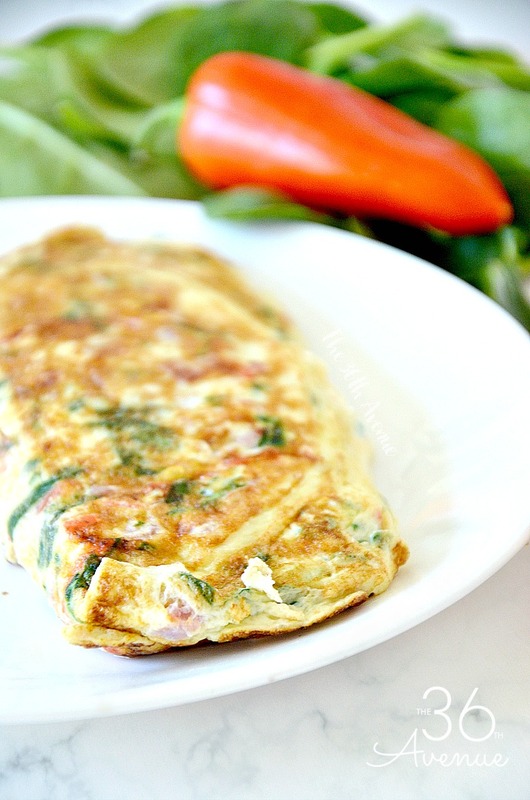 Start your day with a delicious Ham and Vegetable Omelet under 200 calories! In a small size bowl beat eggs together until well blended. Add chopped vegetables and mix well. Flip omelet over and cook for an additional 2-3 minutes. I have some other healthy yummy recipes for you! Hey! Have a delicious day my friends! For more yummy recipes subscribe below!